Oral doses of vitamin D have been considered as a treatment for psoriasis. 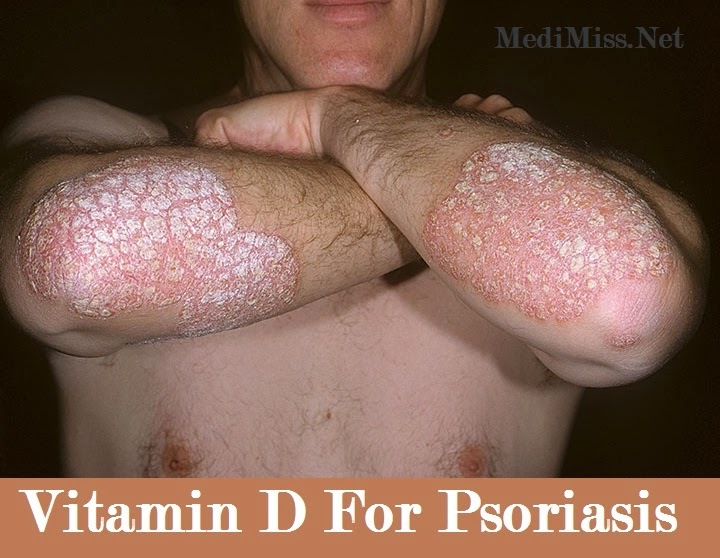 This was sparked by experiments with cholecalciferol or 1,25 dihydroxyvitamin D3 (1,25 (OH)2D3), the active form of vitamin D made in the kidney, which showed promise in treating widespread psoriasis. Using a one microgram daily dose of cholecalciferol, Japanese researchers in 1986 managed to treat 13 out of 17 psoriatic patents within three months. But there are risks involved with this therapy. High doses of vitamin D often leads to hypercalcemia (high blood calcium levels) which is characterized by nausea, vomiting, drowsiness, confusion, high blood pressure, kidney failure, and coma. This was observed in the Japanese study and can occur in those taking 1,000 lUs (international units) or more of vitamin D.
The topical use of cholecalciferol by the same researchers proved to be more beneficial and less toxic. Sixteen out of 19 patients were treated within three weeks with a dose of 0.5 microgram per gram compared to three months with oral doses. Still, the possibility of hypercalcemia remained since vitamin D is absorbed by the skin. That was until researchers at Leo Pharmaceutical Products in Denmark tried to develop a new form of vitamin D which could clear up psoriatic plaques minus the risks encountered in both oral and topical applications of cholecalciferol. That led to the discovery of calcipotriol. Calcipotriol is a vitamin D3 derivative which is just as effective as cholecalciferol in controlling rapid cell growth in psoriatic skin yet 100 - 200 times less likely to produce hypercalcemia. Unlike other creams and ointments, it is colorless and odorless and generally well-tolerated by patients. This vitamin D3 analogue is recommended for the treatment of plaque-type psoriasis and can be used alone or in combination with UVB radiation (which was tackled earlier in this series). The exact mechanism of calcipotriol is unknown but numerous studies have established the efficacy of this drug. Controlled clinical trials have shown that calcipotriol is just as effective as some steroids and more effective than anthranol (both of which were discussed in this series) in treating plaque-type psoriasis. Patients using the recommended dose of 50 micrograms per gram twice daily for six months have not developed hypercalcemia, making calcipotriol safer than other conven¬tional psoriasis regimens. The long-term effects of calcipotriol, however, are unknown and its safety in children and pregnant women has not been established. Using more of the drug can also be dangerous. If you go beyond the recommended dose and use more than 100 grams a week, you may suffer from high blood calcium levels. So far, the only side effect reported is a mild skin irritation that occurs in 10 to 20 percent of patients who use calcipotriol. But this can be controlled by means of careful application. Calcipotriol should not be used on the face and patients are advised to wash away traces of the ointment that accidentally get in other unaffected areas of the skin. If you experience skin irritation, stop treatment and consult a doctor immediately.